This article was written by club member Alan Griffiths and he sent it to me on 28th November 2012. Finally I’ve got around to posting it, sorry for the delay. Because of my work and other things I often find myself away from my home chess club in Nottingham. Recently I found myself in Baarn (in the Netherlands) and after a bit of research found a local chess club: Baarnse Schaakvereniging http://www.baarnseschaakvereniging.nl. I found an email address on the site and arranged to play at the club. My Dutch is very limited (I can guess what a menu means and order a cup of tea) but this wasn’t a problem as the chess players I met were all capable of conversational English and curious about their foreign visitor. In addition to inter-club matches they play a weekly club competition at a rate of 35 in an hour and a half plus 15 minutes to finish. I don’t know exactly how this works, but they draw matches between the players expected each week and have a result at the end of the season. And, thanks to the magic of email my name was already in the draw! I don’t follow all of the commentary, but I gather they’ll try to uphold the honour of the club by finding me a stronger opponent next time. I look forward to that! f3 I thought of getting a black knight established on e4. 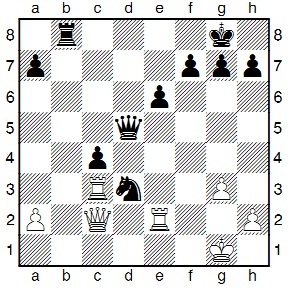 White has the two bishops, some space and better development for the pawn. 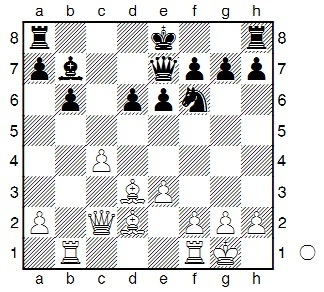 White’s active play has given Black two pawns and active play in return for the exchange. Fritz suggests 20. a4 which avoids the target on f3. 25… Qc5+ 26. Kh1 b5 27. Qd2 Ne5 28. Rf2 (28. Rf4 bxc4 29. Rd4 f5 -+) 28… bxc4? 39. Kg1 Ne5 40. Qe4 Rb8? 41… Nd3 42. Kg2 ?? This entry was posted on Monday, January 14th, 2013 at 1:53 am	and is filed under Updates. You can follow any responses to this entry through the RSS 2.0 feed. You can skip to the end and leave a response. Pinging is currently not allowed. Copyright © 2019 Nottingham Central Chess Club. All Rights Reserved.